Here’s more information on an interesting summer practice couse a friend emailed to me. 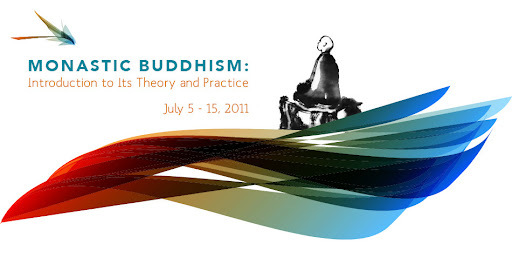 If you’re curious in learning more about Buddhist monasticism in North America, you’ll have a great opportunity this summer with the Dharma Realm Buddhist University course “Monastic Buddhism: Introduction to its Theory and Practice” from July 5 through 15. I’ve reposted the information below. This summer, the Pacific School of Religion and Dharma Realm Buddhist University present a direct encounter with a living Buddhist tradition dating back to ancient China. Students will have the rare opportunity to experience the daily pace and patterns of a Buddhist contemplative and explore a way of life designed to instill peace, equanimity, and awakening. The direct immersion in the rhythms of monastic life combines theoretical grasp with direct experience. Participants will read and discuss sacred texts, learn methods of Buddhist meditation (samadhi), traditional chanting, rituals and liturgies, observe a vegetarian diet, and train according to a Buddhist moral code of conduct (vinaya). This learning “from within”, can spur a process of re-examination—both of oneself and of the assumptions and presuppositions on the nature of religion, the religious community, and the notion of a religious experience. For inquiries, email summer@psr.edu or summer@drbu.org. Prof. Martin Verhoeven and Bhikshuni Heng Chih will lead the course which includes monks and nuns from both the Mahayana and Theravada traditions as guest lecturers. Bhikshuni Heng Chih is a Buddhist nun of over 40 years ordained in the Chinese Mahayana tradition under the guidance of the late Venerable Master Hsuan Hua. She is currently a Lecturer in Buddhist Philosophy at Bond University in Gold Coast, Australia, and holds M.A. and Ph.D. degrees in Translation of Buddhist Texts from Dharma Realm Buddhist University. Prof. Martin Verhoeven is adjunct professor in Comparative Religion at Pacific School of Religion and professor in Buddhist Study and Practice at Dharma Realm Buddhist University. With a M.A. and Ph.D. in History from the University of Wisconsin, he specializes in European and American encounters with Buddhism. Recently named “a sacred site” by National Geographic, CTTB is nestled within 448 acres of orchards, meadows, and woods in Mendocino County, California, just 110 miles north of San Francisco. In addition to being the home of Buddhist monks and nuns, CTTB also houses a university and K-12 school. The quiet countryside landscape and clean air of beautiful Ukiah Valley provide an ideal environment for study, wholesome fellowship, and spiritual growth. You can get more information on the course at its website.